This report presents chemical characteristics of transient unsaturated-zone water collected by lysimeter from the Manning Canyon repository site in Utah. Data collected by U.S. Geological Survey and U.S. Department of the Interior, Bureau of Land Management scientists under an intragovernmental order comprise the existing body of hydrochemical information on unsaturated-zone conditions at the site and represent the first effort to characterize the chemistry of the soil pore water surrounding the repository. Analyzed samples showed elevated levels of arsenic, barium, chromium, and strontium, which are typical of acidic mine drainage. The range of major-ion concentrations generally showed expected soil values. Although subsequent sampling is necessary to determine long-term effects of the repository, current results provide initial data concerning reactive processes of precipitation on the mine tailings and waste rock stored at the site and provide information on the effectiveness of reclamation operations at the Manning Canyon repository. 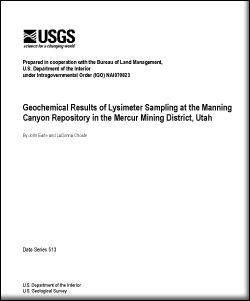 Earle, J.D., and Choate, L.M., 2010, Geochemical results of lysimeter sampling at the Manning Canyon repository in the Mercur Mining District, Utah: U.S. Geological Survey Data Series 513, 6 p.